So, you just spent money to create the most spectacular landscape around your garden. But what happens at night when it gets dark and that work of art can no longer be appreciated? The best way to overcome this problem is through landscape lighting. Landscape lighting is not just for aesthetics, but helps your home be more secure as well without a high cost. Floodlights cast a wide bright beam and can be used to light up tall trees or house facades. Downlights are a LED light often located on tree trunks and branches that shine down to the ground. Well lights are waterproof and are typically buried in the ground to illuminate the underside of plant foliage. Bullet lights are versatile and compact and can be used for precisely lighting a house’s features or garden structures. Garden lights are canopies that reflect light down onto planting beds and can be used as pathway markers as well. From bullet, downlights, flood, well, and garden lights, the variety and style of lights can be quite diverse depending on what you would like to showcase around your home. Seasonal displays no longer need to be left in the dark, but can be showcased 24/7 by incredible light design. Because many exterior lights today are low voltage, consuming one-tenth the power of regular lights, the cost for exterior lighting has dropped drastically allowing any home to have exterior home lighting installed without breaking the wallet. Landscape lighting is perfect for both commercial or residential use and will catch the eye of anyone driving by or visiting your property. Motion detecting flood lights are one of the most effective lights for protecting the exterior of your house from potential burglars or break-ins. These lights are also cost effective as you do not run the risk of leaving them on and racking up the electric bill. Light sensors add an element of surprise to scare away a burglar, and provide a clear view of the area for anyone who may be watching. This can cause the burglar to turn back because of the fear of being caught. According to Safe Guard the World, break-ins are more common when a house appears to be unoccupied. As well as preventing break-ins, exterior lights allow for personal safety and ease when retrieving mail, walking a dog, or taking out the trash at night. 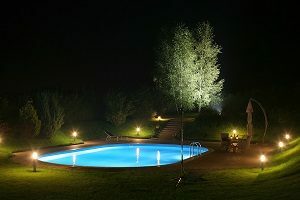 Night lighting can also be used to light walkways, patios, and pools. When done well, landscape lighting not only makes your home or business safer at night, but it showcases your home and keeps it looking beautiful. Home lighting can be intimidating and troublesome to purchase and install if not done properly. It can also be ineffective based on where you install the lights. To solve this problem and to make it easier for you to enjoy the benefits of landscape lighting, we at Greener Horizon are dedicated to providing the most professional and beautiful landscaping and lighting design services that you can find. If you would like to contact us and learn more about how you can have lights installed around your home and receive a free consultation, we would love to hear from you to see how we may serve you by keeping your home safe and aesthetic.